Q: How do you ride the PUMGO? 1. Find a flat and smooth place to ride that is free of traffic or other hazards. 2. Put your front foot on the front part of the board above the front wheels. The arrow on the deck points toward the front. 3. Put your back foot on the board over the back wheels. Use or wall or a friend to steady yourself at first. 5. Once you are moving push the board up and down (like a see-saw) to build up speed. Q: How do I turn the PUMGO? 1. Heel & Toe Steering: to turn toward your heel side, put more weight on you heels. To turn toward your toe side, put more weight on you toes. 2. Kick turns: This is a more advanced way of turning the board and requires you to remove the brake. To kick turn, lift your front foot until the front wheels come off the ground. Keeping your front foot on the board, swing your front leg in the direction you want to turn the board. Q: Do I need to know how to ride a regular skateboard? Q: How does the PUMGO work? A: The PUMGO uses an ingenious 4WD and four wheel steering system to propel the rider without the need to push off the ground. As you push each end of the board down, the toothed metal shaft underneath spins gears inside the gearbox which in turn spins the wheels. Each wheel is equipped with a one-way clutch to allow the right amount of power to get to each wheel and to allow the wheels to spin freely while coasting and turning. Q: Will the PUMGO roll if I stop pumping it? A: Yes. 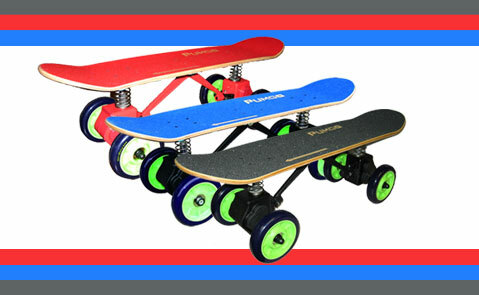 Each wheel has a free wheel mechanism that allows the board to keep rolling even if you’re not pumping. Q: Can I adjust anything on it? A: Yes. You can adjust the steering depending on what type of riding you like to do and how heavy you are. You can adjust the steering to make very sharp turns or wide sweeping turns. See the owner’s manual for adjustment instructions. Q: Where can I ride the PUMGO? A: The PUMGO is ideal for cruising large flat areas. The smoother the surface, the faster you’ll be able to go. Many advanced riders enjoy riding at skateparks. Q: Can I do tricks on the PUMGO? A: The PUMGO is no more dangerous than any other active outdoor sport such as skating, scooter riding or biking. Be sure to always wear protective gear such as a helmet, knee pads and wrist guards. Above all USE COMMON SENSE when riding.